It has only been one game, but you have to admit it was quite the good impression for P-A Parenteau. In his very first game for the Toronto Maple Leafs, he scored two goals in a 4-1 Leafs win on Monday. 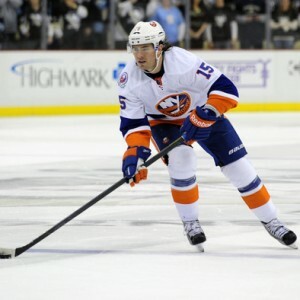 Now, the hope is that he can regain that scoring touch he had when he was with the New York Islanders. Parenteau was drafted by the Anaheim Ducks in 2001 but never played a game for them. He would go on to have stops with the Chicago Blackhawks and New York Rangers. However, he was not much more than an injury call-up both teams, spending most of his time in the AHL. That changed when he got to Long Island. 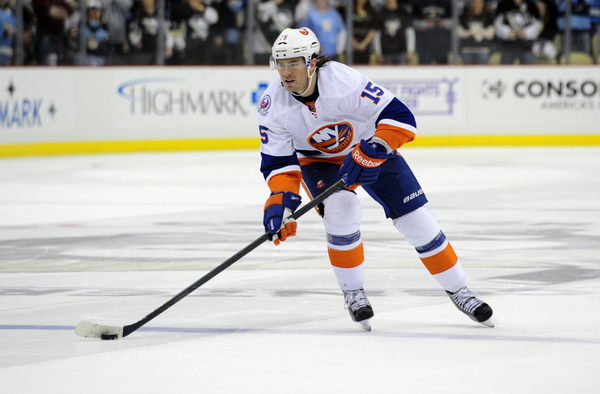 He quickly found his way to playing on the Islanders’ top line alongside John Tavares and Matt Moulson. In his first season, he had a career-year with 20 goals and 33 assists for a total of 53 points. He improved upon that in his second season. With 18 goals and 49 assists and a total of 67 assists, he set himself up well for free agency. He would sign with the Colorado Avalanche and still play pretty well, putting up 43 points in 48 games in the lockout-shortened 2012-13. After that, things started going downhill. He would only post 33 points in 55 games. That would lead to a trade to his native province, going to the Montreal Canadiens for Daniel Briere. He was hampered by injuries and was even a healthy scratch at times, which is puzzling for a team that had trouble scoring. He ended last season with only 22 points in 56 games. He was bought out following the season. This all leads to now. Parenteau should be highly motivated after his last two seasons, especially after being bought out. That can be a real blow to a player that doesn’t have a horrendous cap hit. It means that you didn’t perform well enough to warrant the team keeping him around. If Parenteau can find his offensive game again, it would not be surprising to see him on the top line alongside James van Riemsdyk and either Tyler Bozak or Nazem Kadri. That would be very good for the Leafs in the long run because the better Parenteau is, the higher his trade value becomes. He might be the player that gets the Leafs the most at the trade deadline because of what he’s done in the past. That is only if he has a good season this year. That will be the really the only way he can be useful to the Leafs. He doesn’t seem like a player that will be around when the Leafs are back in contention. However, if the Leafs can get a good draft pick or prospect in a trade for Parenteau, then it could work more than just a regular stop-gap would.